Gloria Swanson is best known for her blockbuster role as the 50-year-old, over-the-hill film goddess Norma Desmond in “Sunset Boulevard,” but her early, wide-ranging Silent film career deserves equal notice. Unlike most actresses of her era, Swanson excelled in both comedic and dramatic roles, beginning in comedies as a 17-year-old at Essenay Studio in Chicago. She soon moved to Los Angeles, where Mack Sennett turned her into a Keystone star. But Swanson wanted to be more than a comedienne: she was determined to be a romantic leading lady. In Cecil B. DeMille’s 1919 hit, “Don’t Change Your Husband,” she became one. She was only 20 when DeMille made her a dramatic star, but she had already been married and divorced, having entered a disastrous 2-month marriage (at 17) to Wallace Beery. Beery not only raped her on their wedding night but, upon discovering she was pregnant, gave her an abortion-inducing drug. She would soon embark on the second of six brief marriages, only the last of which, undertaken in her late 70s, lasted longer than five years. Nevertheless, it was her not-so-secret romance with Joseph P. Kennedy, circa 1927-1930, that cemented Swanson’s reputation as a femme fatale off-screen as well as on. Kennedy was not only a permanently married Catholic but a father of seven children (with two yet to come). 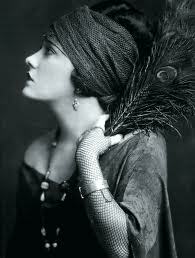 Such was Swanson’s appeal that he rapidly became not only her paramour (she was married at the time to the poshest of her husbands, the Marquis Le Bailly de la Falaise de la Coudraye) but her film producer and business partner. Swanson and Kennedy’s most famous collaboration, “Queen Kelly,” was considered a disaster upon its release but later grew to be considered one of Swanson’s best films. When the couple split in 1930, it was over money–Kennedy’s flagrant spending of Swanson’s, which the actress complained about throughout her life. Fortunately, Swanson was a canny investor in real estate. In addition to her magnificent Beverly Hills home–the 22-room King Gillette mansion at 904 N. Cresent Drive–she at various times owned valuable properties in London, New York and Portugal, and seems never to have owned fewer than two houses at a time. 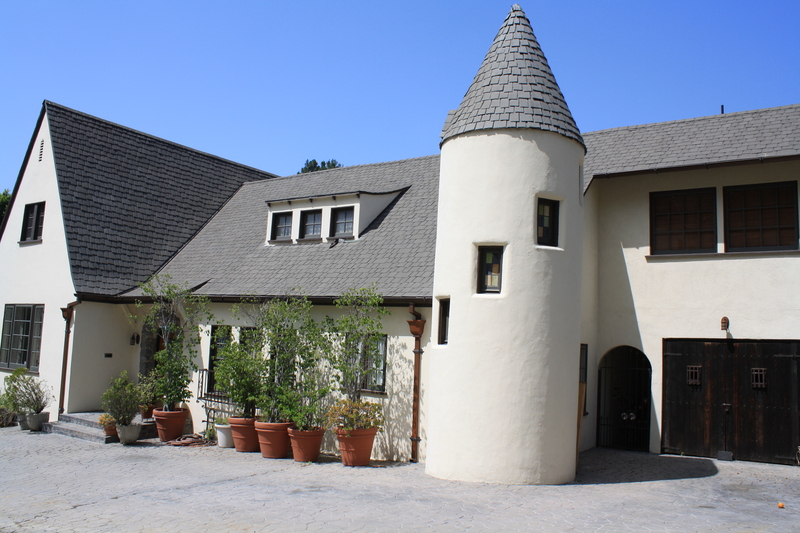 She also had a secret home in Los Angeles: this mid-twenties Norman manor in Hollywoodland. Although it was never her official residence, Swanson certainly spent time at the house, a fact confirmed by an elderly neighbor when the current owner bought it during the 1970s. It seems more than likely that the house was a love nest for Swanson and Kennedy, a place for them to enjoy each other’s company out of the public eye. She couldn’t have chosen a better location: even if her neighbors knew about the affair, they were unlikely to have gossipped about it–privacy having been a hallmark of Hollywoodland since its beginnings in 1923. 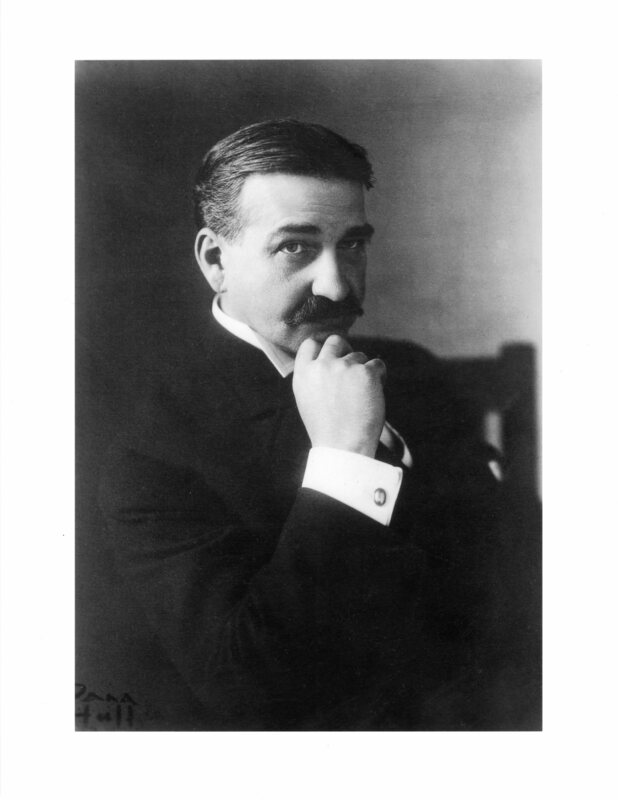 Lyman Frank Baum was a former poultryman, actor, playwright, newspaper reporter, editor and traveling salesman who transformed his life in middle age by writing The Wizard of Oz. A groundbreaking best-seller that dispensed with the moralizing and scaremongering that had characterized children’s literature, The Wizard of Oz came to be considered the first modern children’s book, an instant classic whose appeal never faded. There were lovely patches of green sward all about, with stately trees bearing rich and luscious fruits. Banks of gorgeous flowers were on every hand, and birds with rare and brilliant plumage sat and fluttered in the trees and bushes. Oz was beautiful; it was also a tidy, prosperous utopia, recognizably mid-American in its benevolent technology and bourgeois prosperity….Unbothered by poverty, served by proper machines in lovely gardens, cared for by a benevolent political order, the citizens of Oz were able to concentrate on the business of living, which for them was the life of emotion and imagination…. 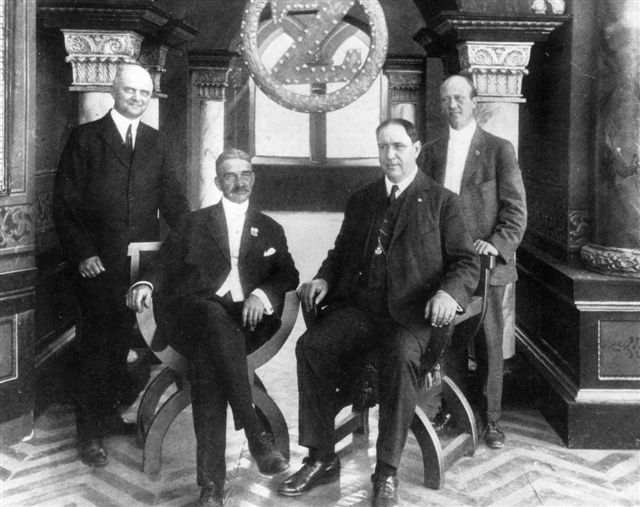 By moving to Hollywood, Frank Baum underscored its connection to Oz. (In the same vein, he named his cocker spaniel Toto.) Although he, his wife Maud and their four sons were already part-time Californians, having spent six previous winters at the Hotel del Coronado, they now would be full-time citizens of a real-life utopia. 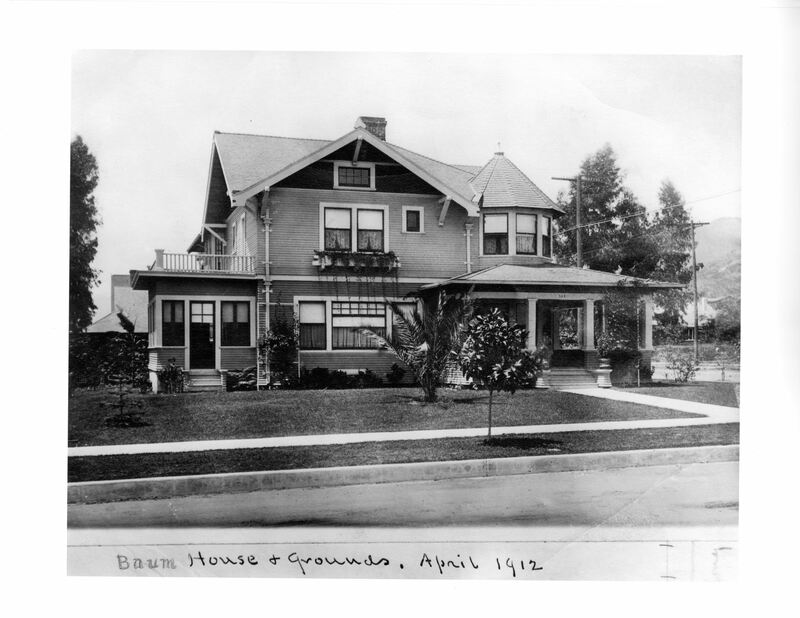 Baum built his dream house at Cherokee and Yucca and named it Ozcot. The house featured an enormous fireplace, a library and solarium and, in typical Midwestern style, a large attic. As he had for the Hotel del Coronado, he designed beautiful lighting fixtures for the dining room. In the large garden, Baum grew dahlias and chrysanthemums that brought him fame as a serious, prize-winner horiculturalist. He also raised chickens, as he had in his youth. 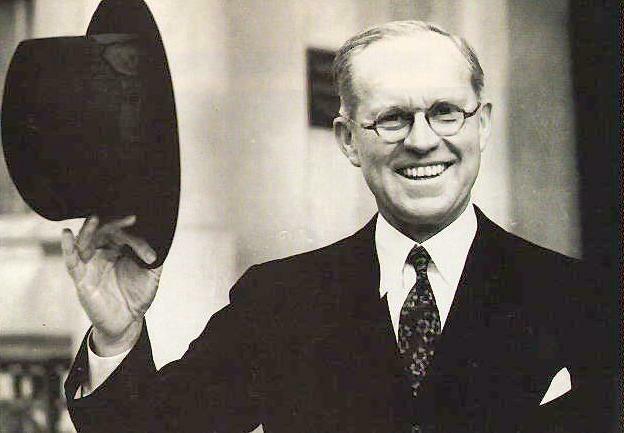 Baum joined the Uplifter’s Club (now defunct but still remembered by local old-timers), as well as all the other clubs in Hollywood, and was an enthusiastic civic booster. Not content to be merely a famous author, he founded his own studio, the Oz Film Manufacturing Company, with fellow Uplifters in 1914. The studio produced ten films that were technologically advanced for the day, including the original, silent “Wizard of Oz,” before going broke and being sold to Universal. Going broke was a familiar occurrence for the Baum family. Although Frank Baum was a prolific writer of novels–including 13 sequels to The Wizard of Oz–short stories, plays and poetry, he had money problems throughout his life. The product of a wealthy family, he lost vast sums on failed theatrical productions, one of which, “Fairylogue and Radio Plays” drove him into bankruptcy. The mind that created Oz (named for the O-Z drawer of his filing cabinet) was not adept at business of any kind. (From 1888 to 1890, the Baums owned a general store in the Dakota Territory; even that potential goldmine failed.) The funds for Ozcot, and probably the Oz Film Manufacturing Company, came out of Maud’s inheritance from her mother, the feminist Matilda Joslyn Gage, and her father, a merchant. Maud, a Cornell graduate, took up sewing to keep the family afloat as Baum veered in and out of debt. Frank Baum had suffered from heart problems for years, and the stress of his failed studio probably contributed to the stroke that killed him in 1919, at 63. His last words purportedly were, “Now we can cross the Shifting Sands,” a reference to his best-known book. Although the Technicolor version of “The Wizard of Oz” would not appear until 1939, Maud and their sons were alive to see its success–and to reap $40,000 of its income . Kevin Starr, Material Dreams: Southern California Through the 1920′s. Oxford University Press, 1990. You are currently browsing entries tagged with Chicago at Under the Hollywood Sign.